You've come to the right place for all your custom needs. We are more than just a standard print and design shop. While we are always focused on turnover and quality, our main drive comes from our precise focus for the visual arts. We at IVSP are successful at what we do for the true and simple reason: We speak the language of art and print, and successfully translate that day in and day out to ensure that your idea blossoms into a final masterpiece. 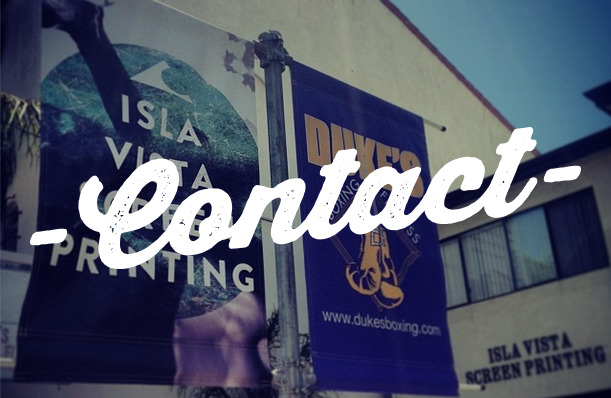 Whether it is decorated apparel, design, large format banners, or promotional goods, Isla Vista Screen Printing makes certain that not only does your idea get across to your target market, but it's a darn good one. A smooth blend of 25 experienced years of screen printing and youthful, energetic approach to art, emotion, and relationships are what make Isla Vista Screen Printing unique. We come to you as a friend; you leave as a satisfied customer. We empathize, simplify, and can prescribe a daily dose of whatever-you-need. Again, we are not your standard print and design shop, we are IVSP. Our office is located at 6565 Trigo Rd. in Isla Vista, CA. We are in the heart of the unique, artistic Isla Vista community and the beautiful and sunny Santa Barbara area. As an alumnus to UC Santa Barbara, we have to represent the blue and gold. Olé Gauchos! Come pay us a visit. We have a full retail shop of Isla Vista and UCSB apparel and accessories. All of our products are designed and hand-forged by Isla Vista Screen Printing.